I'm using Kubuntu Netbook, which defaults to size 7 & 8 fonts. 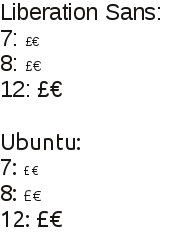 At these sizes, the £ and € symbols become a bit difficult on the eyes. 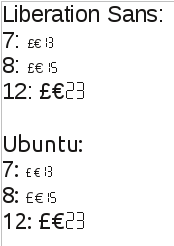 I'm attaching a screenshot comparing the Ubuntu font and Liberation Sans at sizes 7, 8, and 12 so the difference can be seen. 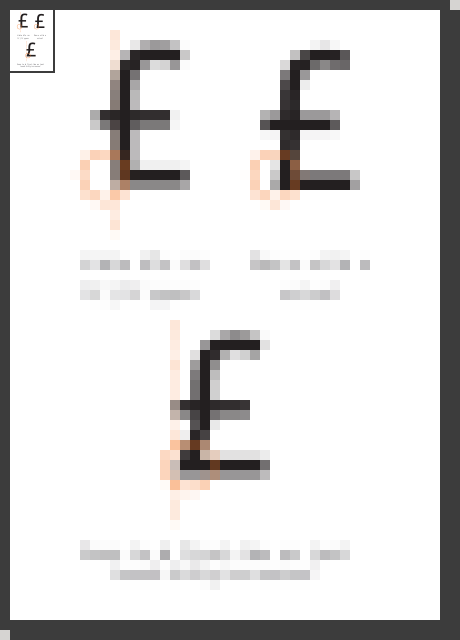 Mainly, I think the bottom line of £ needs to extend further to the left like it does at size 12 (at sizes 7 & 8 it almost looks like a C with a graphical artifact making it slightly crooked) and that the €'s bars should be a bit closer together since at sizes 7 & 8 it turns into a muddle of horizontal lines with the top edge, two bars, and bottom edge all being equidistant. 135 dpi at 7/8 pt makes this 13/15 ppem, this appears to be rendered with hinting enabled, so I can see the potential for tweaking it. Perhaps in the hinting for the node at the bottom-left of the £ would do with pushing out a bit, so that the rasterised shape has less of a curved/'C' appearance at smaller sizes; eg. more akin to the Hebrew bet ('ב') in reflection and a more definite corner. maco: to confirm, please can you retake the screenshot with the magic '' character pasted in after each of the pound signs. This will confirm the hinting and ppems in use. Thanks for the feedback, looking at the screen shots attached, the £ and € symbols don't seem ambiguous to me at the point sizes specified. The two middle horizontals are visible even at the 7 points. crossed-fancy-L with the lack of little...thingy...sticking out the left side. down to 75% in the GIMP and look at it? expect to see a loop on a sans-serif £ design. David: I what is happening here is that the feature that makes the £ unambiguous is the concave knee at the bottom left, but the current hinting loses this at 13/15 ppem by snapping to the vertical, rather snapping in the opposite direction (to be level with the left-hand extent of the cut-line). See the attached PDF for what is happening and the likely solution ensuring that the knee always remains concave. ...and the PDF version of that. would contend that the current solution is completely unambiguous, however. curvature without overly-distorting the character. stem, not by distorting the vertical stem. It's "only" 1-pixel, but that pixel is critical in preserving the legibility of the /apparent/ shape. Screenshot of PDF rasterised at approximate sizes under discussion. Hopefully showing how the suggested hinting adjustment should improve the legibility whilst increasing the /perceived/ similarity to the true outline form with its slight back-kick in the bottom-left.